Please note that the content of this book primarily consists of articles available from Wikipedia or other free sources online. 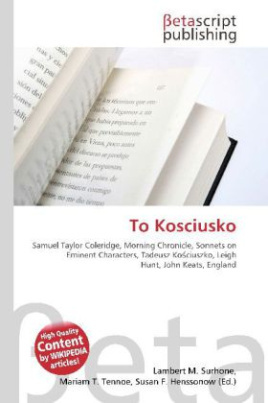 "To Kosciusko" is a sonnet that was originally written by Samuel Taylor Coleridge in December 1794. The poem was published in the 16 December 1794 Morning Chronicle as the fifth of his Sonnets on Eminent Characters series. However, Coleridge''s poem was not the only poem by the name and about Tadeusz Ko ciuszko, a leader of the 1794 Polish rebellion against Prussian and Russian control. He inspired Leigh Hunt and John Keats to follow his poem later with their own versions under the same title in November 1815 and December 1816 respectively. The sonnet were dedicated to Kosciusko''s heroism and fighting for liberty.